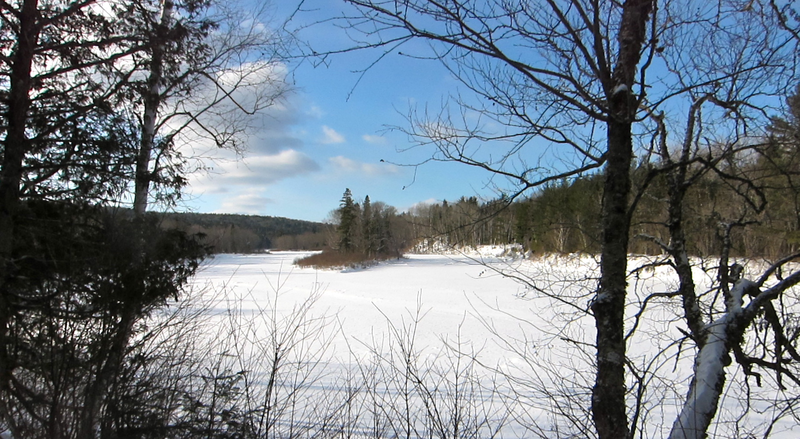 A beautiful, -26°C or -15F° day on the Little Southwest Miramichi River. It seems as though every winter ecology paper contains some variant of this sentiment – we know that winter is important, but we’re not crazy enough to study it. As researchers, we’ve built sampling regimes that ignore an entire season because winter is harsh and unforgiving. It’s cold, sharp, and sometimes deadly to us, and so we operate under the assumption that the same goes for the creatures we study. Alas, it is not so. There’s a lot going on under the snow, and even more going on under the ice. For example, Atlantic salmon eggs incubate in the gravel under river ice in Eastern Canada for six frigid, snowy months at water temperatures barely above 0°C. They emerge from the gravel during the spring melt period, when ice jams bulldoze forests and water levels climb metres in minutes. These tiny fish are at the mercy of a dynamic and unpredictable season, and we barely know anything about it. As a pampered girl from ‘tropical’ Toronto, I never imagined myself riding a snowmobile and hacking through river ice in the middle of New Brunswick. However, through a serendipitous connection, I recently found myself doing both – while pursuing a Masters degree supervised by Dr. Richard Cunjak at the Canadian Rivers Institute and the University of New Brunswick. In Eastern Canada’s Miramichi River system where I conduct my fieldwork, salmon eggs incubate in the gravel riverbed from late October to early May, during which time they experience highly variable winter conditions. In November, air temperatures can drop dramatically overnight (usually to about -20°C or -4°F) and water may reach it’s freezing point quickly due to contact with the atmosphere, and freeze inconsistently due to turbulence and mixing. As water crystallizes, it can stick to itself and the river substrate, forming anchor ice – a squishy carpet of accumulated ice crystals on the riverbed. This ice may form on top of salmon nests (or “redds”), which probably has implications for water flow through the gravel and consequently water temperature and dissolved oxygen levels. 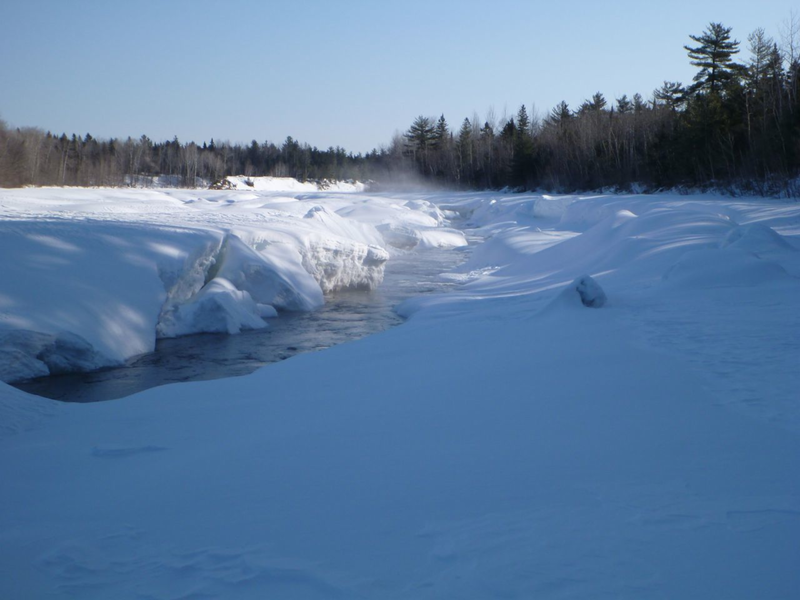 Winter is a dynamic season – here, a seeping plume of warm, long-residence groundwater melts a thin trail through thick surface ice on the Little Southwest Miramichi River in northern New Brunswick, Canada. Once full ice cover forms and surface runoff is locked up in the snowpack, long-residence groundwater may be the major contributor to river discharge. Long-residence groundwater is water that has spent a considerable amount of time in an aquifer deep underground. Consequently, it is often warmer than the surface water in the winter, and can have significantly lower dissolved oxygen concentrations since it has not been recently aerated. As this groundwater intrudes through the river substrate, the incubation conditions in redds can change dramatically. Depending on the size of the groundwater seep, the rate of egg development may accelerate due to warmer water temperatures. These eggs likely need more oxygen to sustain their accelerated rate of development, however the seeping, oxygen-poor groundwater is unable to meet this demand. Without enough oxygen, these eggs may die or experience “sub-lethal” effects – consequences that may impact their survival later in life as free-swimming fish. These may include stunted growth or developmental deformities, which may impair gas exchange, swimming ability, neurological function, etc. During the spring melt period, silt and clay concentrations in surface runoff water can increase considerably. Depending on the grain size, these sediments may clog the egg membrane and prevent diffusion of oxygen to the embryo, effectively suffocating the fish. Furthermore, as ice breaks up and moves out of rivers, scour along the riverbed may cause significant mechanical damage to redds, which may destroy or seriously damage embryos in the gravel. Studying our system during the open-water period only gives us half the story… There’s more going on under the ice than meets the eye! It is hard to believe that, after considering all of the variation inherent in winter and its potential effects on one life stage of one species in one type of habitat, winter goes largely unnoticed in the scientific literature. It is, certainly, a challenging season to research. I’ve had my fair share of winter mishaps, including digging a snowmobile out of a slush puddle for three hours, miscalculating ice thickness (not ideal! ), hypothermic near-misses, and tethering myself to a tree during the spring melt! Snow and ice don’t make fieldwork easier, but they definitely make it more fun. 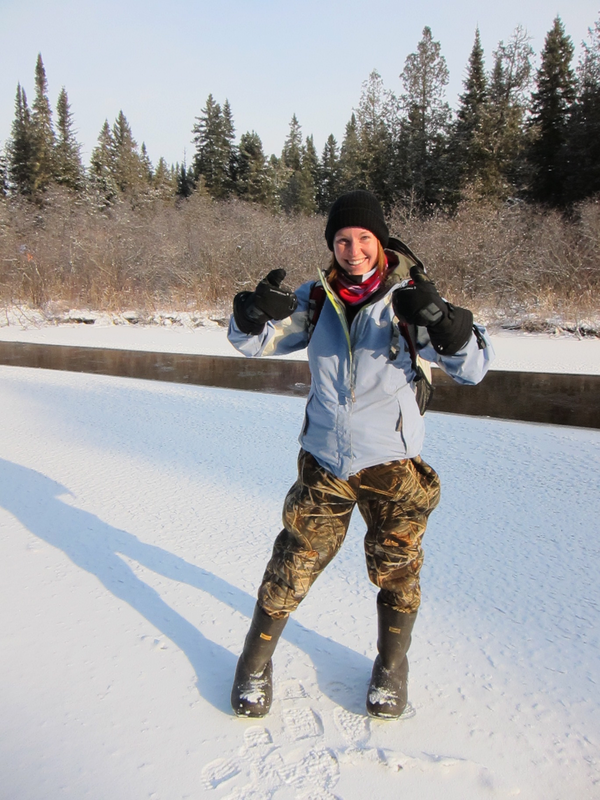 One could argue that winter research is the last true frontier of freshwater ecology – there are so many unknowns to explore, and so many questions left unanswered. If we can get past our numb fingers and dripping noses, there’s a whole season just waiting to be studied. It might not be “researcher-friendly,” but it’s definitely exciting! Plus, who doesn’t love a good mid-river snowball fight? Michelle Lavery is a Masters student supervised by Dr. Richard Cunjak at the Canadian Rivers Institute at the University of New Brunswick in Fredericton, Canada. Cunjak, RA, TD Prowse, and DL Parrish. 1998. Atlantic salmon (Salmo salar) in winter: “the season of parr discontent”?. Can. J. Fish. Aquat. Sci. 55(Suppl. 1): 161-180. Flanagan, JJ. 2003. The impacts of fine sediments and variable flow regime on the habitat and survival of Atlantic salmon (Salmo salar) eggs. MSc Thesis: University of New Brunswick. Greig, SM, DA Sear, and PA Carling. 2005. The impact of fine sediment accumulation on the survival of incubating salmon progeny: Implications for sediment management. Sci. Total. Environ. 344 (1-3): 241-258. Kane, TR. 1988. Relationship of temperature and time of initial feeding of Atlantic salmon. Prog. Fish-Cult. 50: 93-97. Louhi, P, M Ovaska, A Maki-Petays, J Erkinaro, T Muotka, and J Rosenfeld. 2011. Does fine sediment constrain salmonid alevin development and survival? Can. J. Fish. Aquat. Sci. 68(10): 1819-1826. Malcolm, IA, SM Greig, AF Youngson, and C Soulsby. 2008a. Hyporheic influences on salmon embryo survival and performance. American Fisheries Society Symposium, 65:1-24. Malcolm, IA, C Soulsby, AF Youngson, DM Hannah, IS McLaren, and A Thorne. 2004. Hydrological influences on hyporheic water quality: implications for salmon egg survival. Hydrol. Process. 18(9): 1543-1560. Malcolm, IA, C Soulsby, AF Youngson, and DM Hannah. 2005.Catchment-scale controls on groundwater-surface water interactions in the hyporheic zone: implications for salmon embryo survival. River Res. Applic. 21(9): 977-989. Malcolm, IA, C Soulsby, AF Youngson, and D Tetzlaff. 2008b. Fine scale variability of hyporheic hydrochemistry in salmon spawning gravels with contrasting groundwater-surface water interactions. Hydrogeol. J. 17(1): 161-174. Malcolm, IA, AF Youngson, and C Soulsby. 2003. Survival of salmonid eggs in a degraded gravel-bed stream: effects of groundwater-surface water interactions. River Res. Applic. 19(4): 303-316. Prowse, TD. 2001. River-ice ecology. 1: Hydrologic, geomorphic, and water-quality aspects. J. Cold Reg. Eng. 15: 1-16. Prowse, TD. 2001. River-ice ecology. 2: Biological aspects. J. Cold Reg. Eng. 15: 17-33. Soulsby, C, AF Youngson, HJ Moir, and IA Malcolm. 2001. Fine sediment influence on salmonid spawning habitat in a lowland agricultural stream: a preliminary assessment. Sci. Total. Environ. 265 (1-3): 295-307.